Power boating and canoeing are enjoyable and popular pastimes at Carp Lake, provided reasonable care is practiced. The lake is subject to high winds and consequent rough waters that can be responsible for swamping the unwary. Watch the weather and always wear your lifejacket. Powerboat operators are requested to please reduce speed in Kettle Bay to prevent damage to boats and equipment and to reduce erosion of the lakeshore. Travelling on forest roads is somewhat different from travelling on public highways. For your own safety, drive with extreme caution at all times. Give logging and industrial traffic the right-of-way by moving to the nearest turnout or pulling off the travelled right-of-way as far as possible. Allow overtaking traffic to pass. Drive with lights on – especially under dusty conditions – to make yourself more visible. Park well off the travelled portion of the road if you must stop along the way. The weather pattern at Carp Lake is fairly typical of the north central region of the province. Summers are short and relatively cool, with July temperatures averaging 12-18°C. Evenings may see dramatic temperature drops. Winter comes early and blankets the area with snow. January temperatures usually hover between -12°C and -18°C. Annual precipitation is about 50 cm, of which about 40% is in the form of snow. Carp Lake Provincial Park is relatively isolated and supplies nothing but water and firewood. The nearest supplies are 32 kilometres away in the community of McLeod Lake. National Topographic Series Map 93J/14 (Carp Lake) at a scale of 1:50,000 covers the park area. This map is available from most map retailers in British Columbia. Reservations are accepted at this park for the islands and Bert's Cabin only. All other sites are available on a first-come, first-served basis. Outside of reservable dates, all campsites are first-come first-served. 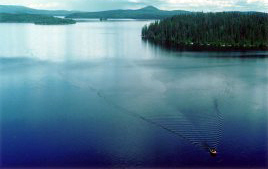 Carp Lake Park is two hours drive northwest of Prince George. The main access road to the park joins Highway 97 (the John Hart Highway) at the community of McLeod Lake, 141 km north of Prince George. It is 32 km from McLeod Lake to the Carp Lake campground. This gravel road is single lane over part of its length, and has some rough surfaces and tight corners. The road may not be suitable for cars or trailers during the spring break-up period. Some portions of the road must be shared with industrial traffic. The closest communities, towns and cities are Prince George, Bear Lake, McLeod Lake and MacKenzie. The management plan for Carp Lake Park was approved in April 2017. Canoeing and kayaking are very popular at this park. The islands offer backcountry camping and you can register at the boat launch at Carp Lake. The lake is subject to high winds and consequently rough waters that can be responsible for swamping the unwary. Watch the weather and always wear life-jackets. Carp Lake is legendary for its fine trout fishing. Mcleod River offers excellent Fly fishing opportunities. Anyone fishing or angling in British Columbia must have an appropriate licence. Carp Lake is popular for ice fishing as long as you have a snowmobile to travel to this lake; the main gate is left open during the winter months. There are no services but camping is possible under the picnic shelter. It has a large wood stove. This park is open to hunting. Please check the Hunting and Trapping Regulations for more information. There are two sandy, very attractive beaches at this park; one is a 20 minute hike and the other is a 40 minute hike from the Carp Lake campground. There are NO LIFEGUARDS on duty at provincial parks. There are no viewing platforms in this park but there are bridges over wet areas with interpretive signs highlighting special features and items of interest, particular to the park. Abundant wildlife inhabits the park. Larger mammals such as black bears and deer are often seen. Moose frequently forage in the marshy areas about the lake and from time to time may be seen swimming to or from the islands. Waterfowl are prevalent during migratory and nesting periods. The haunting cry of the loon often echoes over the lake. War Falls on the McLeod River, just downstream from the outlet of War Lake, are a scenic attraction easily accessible from the access road. The falls are comprised of two cascades separated by about 100 metres of rushing, white water. The upper falls are close to six metres in height and the lower falls are approximately 12 metres high. There is the possibility of back-country skiing, snowshoeing and winter camping in the park. There are no services but camping is possible under the picnic shelter which has a large wood stove. In Prince George and Mackenzie, organized clubs have groomed a network of trails. Snowmobiling is allowed in the park and most visitors come to ice fish or sight see; remain on roads that are not plowed and snowmobile on the lakes. There are organized snowmobile clubs in Prince George and Mackenzie. Carp Lake is popular for ice fishing as long as you have a snowmobile to travel to this lake; the main gate is left open during the winter months. There is a double concrete boat launch at the Carp Lake Campground that is capable of handling standard boat trailers, but caution should be exercised. After launching, trailers and towing vehicles must be returned to the campground or parking lot before going boating. There is a gravel car-top boat launch at War Lake. Power boating is an enjoyable and popular pastime at Carp Lake, provided reasonable care is practiced. The lake is subject to high winds and consequent rough waters which can be responsible for swamping the unwary. Watch the weather and always wear your lifejacket. Powerboat operators are requested to please reduce speed in Kettle Bay to prevent damage to boats and equipment and to reduce erosion of the lakeshore. Bert's Cabin: Site includes one cabin (Maximum Occupancy: 4 people) and three tent pads (Maximum Occupancy: 4 people / tent pad). Available by reservation through Discover Camping. Cabin and Tent Pads Fee: $88.00 per party/night. Cold water taps are located throughout the park. Taps are shut off during the off season. There are also hand-pumps available in the park. There are group campsites available. Reservations are not required. There is a day-use/picnicking area with picnic tables and parking area. There is also a large picnic shelter with a wood stove. There are 13 pit toilets, no flush toilets. There is a playground and horse-shoe pitches at the Carp Lake Campground. During the collecting season a sani-station/dump is available at the Carp Lake Campground. There are 102 campsites at this park available on a first-come, first-served basis. During the winter months, the main gate is left open. There are no services but camping is possible at the picnic shelter as it has a large wood stove. War Lake – There are 12 campsites near the east end of War Lake. Not suited for long units. Water pumps, pit toilets, firewood and a car-top boat launch are provided. Carp Lake – There are 90 sites at Kettle Bay. Will accommodate tents and most recreational vehicles. A playground, horseshoe pitches and picnic shelter are located within the campground. Running water, pit toilets and firewood are provided. Boaters and canoeists can choose among three island campsites that offer secluded camping. Boat-accessible camping is available with rudimentary facilities on Balsalm, Spirea, and White Spruce Islands, as well as at Bert's Cabin. No garbage facilities are available. Please bring your garbage back to the boat launch for disposal. These sites are user-maintained outside of the main camping season. Please leave your site as clean as you found it or cleaner. These sites are only accessible by boat and are available by reservation only through Discover Camping. Walk-in/cycle in Camping Fee: $13.00 per party / night. Maximum Occupancy 4 people/ site. Bert's Cabin camping: Site includes one cabin and three tent pads.